2017 has been a year of speaking out about bad behavior, silence and inaction. The 2017 Word of the Year is complicit, says Dictionary.com. Complicit, defined as "choosing to be involved in an illegal or questionable act, especially with others," was the annual pick of a word "indicative of larger trends that resonated throughout the year," the company said. The choice was made by the online dictionary's in-house experts ― lexicographers, the marketing and product teams, and the CEO. "Lookups for the word complicit increased by nearly 300 percent in searches in 2017 as compared to 2016," Liz McMillan, CEO of Dictionary.com, said in a press release. "We continue to see a direct correlation between trending word lookups and current events, and we find it encouraging that our users are dedicated to understanding the language and words that pop up in the biggest news stories of the year." Dictionary.com cites many newsworthy 2017 moments that facilitated the use of complicit, including times when people called out the powerful for misdeeds and for silence in the face of wrongdoing. 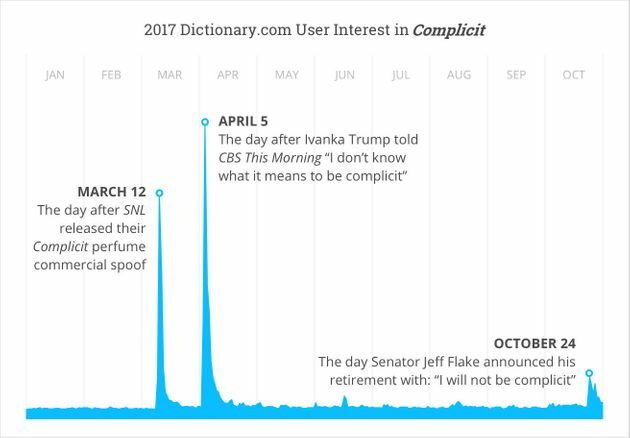 Searches for the word complicit spiked during political happenings, Hollywood scandals and natural disasters, Dictionary.com said. The year's first surge for the word was on March 12, after a "Saturday Night Live" sketch featuring Scarlett Johansson as Ivanka Trump in a perfume ad for a fictional scent called "Complicit." The satirical tagline for the fake beauty product was: "The fragrance for the woman who could stop all this, but won't." The word cropped up again after reports of collusion between Russia and President Donald Trump during his 2016 campaign, then again after the former head of the Democratic National Committee claimed the party's nomination of Hillary Clinton was "rigged." Searches for complicit also rose when Trump pulled out of the Paris climate accord, "furthering concern that human complicity is hastening our planet's demise," Dictionary.com said. Complicit surged again as allegations of sexual misconduct mounted against film executive Harvey Weinstein. The stories of abuse unleashed a boom of claims against the likes of Republican Senate candidate Roy Moore, actor Kevin Spacey, comedian Louis C.K., and many others. The notion of complicity in many of the misconduct scandals is clear: The offender couldn't have continued perpetrating heinous acts without the silence of others. Dictionary.com noted in a blog post about its Word of the Year that the selection is "as much about what is visible as it is about what is not." It's a word that reminds us that even inaction is a type of action. The silent acceptance of wrongdoing is how we've gotten to this point. We must not let this continue to be the norm. If we do, then we are all complicit.